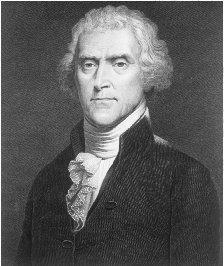 THOMAS JEFFERSON was inaugurated third president of the United States on 4 March 1801 in the infant capital on the Potomac. Raw, brash, and eager, a sprawling village of three thousand people—"a place with a few bad houses, extensive swamps, hanging on the skirts of a too thinly peopled, weak and barren country"—Washington was a fitting symbol of the new nation itself. Two "shining objects" relieved the dismal scene: the President's House, gleaming under its coat of whitewash, and the Capitol, looking like some truncated Roman monument, its north wing alone awkwardly perched on the summit of a hill. Surrounded by friends, Jefferson walked to the Capitol from a nearby boardinghouse; at noon, without pomp or ceremony, he entered the crowded Senate chamber and took his place on the platform between Aaron Burr, his successor as vice president, and John Marshall, the chief justice of the United States. The election that brought Jefferson to the presidency had been bitterly contested by the two political parties, Federalists and Republicans, and only finally terminated on 17 February in the choice by the House of Representatives between himself and his Republican running mate, Burr. Now, after Marshall administered the oath of office, the fifty-seven-year-old Virginian, tall and lanky, with a ruddy face, bright hazel eyes, and graying hair, rose to deliver his inaugural address. The address—a political touchstone for a century to come—combined a lofty appeal for the restoration of "harmony and affection" with a brilliant summation of the Republican creed: "We have called by different names brethren of the same principle. We are all republicans: we are all federalists." Believing that the mass of Americans, regardless of party, were fundamentally united in their political sentiments, Jefferson hoped to extinguish the strife, hatred, and fanaticism—the spirit of European politics—that had rocked the Republic during its first decade. the strongest government on earth. I believe it is the only one where every man, at the call of the law, would fly to the standard of the law, and would meet invasions of the public order as his own personal concern. Sometimes it is said that man cannot be trusted with the government of himself. Can he, then, be trusted with the government of others? Or have we found angels in the form of kings to govern him? Let history answer this question. In retrospect, Jefferson called the Republican ascendancy "the revolution of 1800." It was, he said, "as real a revolution in the principles of our government as that of 1776 was in its form; not effected indeed by the sword, as that, but by the rational and peaceable instrument of reform, the suffrage of the people." Julian P. Boyd et al., eds., The Papers of Thomas Jefferson , 30 vols. to date (Princeton, N.J., 1950–1995), promises to be the definitive edition of Jefferson's writings. As of this writing the project has not yet reached the period of Jefferson's presidency, for which two earlier works remain serviceable: Paul L. Ford, ed., The Writings of Thomas Jefferson , 10 vols. (New York, 1892–1899), and A. A. Lipscomb and A. E. Bergh, eds., The Writings of Thomas Jefferson , 20 vols. (Washington, 1904–1905). See also Thomas Jefferson, Writings (New York, 1984), ed. by Merrill D. Peterson. Among biographies, the fullest and most authoritative is Dumas Malone, Jefferson and His Time , 6 vols. (Boston, 1948–1981). Merrill D. Peterson, Thomas Jefferson and the New Nation: A Biography (New York, 1970), runs to 1,000 pages, while Noble E. Cunningham, Jr., In Pursuit of Reason: The Life of Thomas Jefferson (Baton Rouge, La., 1987), runs to 350 pages. Peterson is the editor of the multi-authored Thomas Jefferson: A Reference Biography (New York, 1986). Peter S. Onuf, ed., Jeffersonian Legacies (Charlottesville, Va., 1993), is a contemporary assessment by sixteen scholars. Other studies of Jefferson's thought include Garrett Sheldon, The Political Philosophy of Thomas Jefferson (Baltimore, 1991), and David N. Mayer, The Constitutional Thought of Thomas Jefferson (Charlottesville, Va., 1994). A seminal study is I. Bernard Cohen, Science and the Founding Fathers: Science in the Political Thought of Jefferson, Franklin, Adams and Madison (New York, 1995). For the presidency, Henry Adams, History of the United States of America During the Administration of Thomas Jefferson , 2 vols. (New York, 1930), is still an important and immensely readable source. Other more specialized or broadly interpretive books on the subject are Forrest McDonald, The Presidency of Thomas Jefferson (Lawrence, Kans., 1976); Robert M. Johnstone, Jr., Jefferson and the Presidency: Leadership in the Young Republic (Ithaca, N.Y., 1978); and Noble E. Cunningham, Jr., The Process of Government Under Jefferson (Princeton, N.J., 1978). See also Leonard D. White, The Jeffersonians: A Study in Administrative History, 1801–1829 (New York, 1951), and James Sterling Young, The Washington Community, 1800–1828 (New York, 1966). Foreign affairs are the focus of Bradford Perkins, The First Rapprochement: England and the United States, 1795–1805 (Philadelphia, 1955), and Prologue to War: England and the United States, 1805–1812 (Berkeley, Calif., 1961); Burton Spivak, Jefferson's English Crisis: Commerce, Embargo, and the Republican Revolution (Charlottesville, Va., 1979); and Robert W. Tucker and David C. Hendrickson, Empire of Liberty: The Statecraft of Thomas Jefferson (New York, 1990). Merrill D. Peterson, The Jefferson Image in the American Mind (New York, 1960), pursues the Jefferson theme and symbol in American thought and imagination. The best guide to the historical literature is Frank Shuffelton, Thomas Jefferson: A Comprehensive, Annotated Bibliography of Writings About Him, 1826–1980 (New York, 1983), with a supplement (1992). Recent works include Joseph J. Ellis, American Sphinx: The Character of Thomas Jefferson (New York, 1997). I wanted to use this article as a resource for my history paper, but there is no publication date posted on the page. Posting the publication date would be helpful to anyone using this article for research, not to mention that it would add a sense of authenticity and professionalism to the article.